Yahagi, the second Japanese warship of that name, was the third of the four Agano-class vessels (the other three being Agano, Noshiro and Sakawa). Construction of the Agano-class cruisers was approved by the Japanese parliament (Diet) in March 1939 under the Fourth Naval Armaments Enhancement Program (Dai-Yon-Ji Kaigun Gunbi Jūjitsu Keikaku), also known “Four-in-Circle Program (Maru Yon Keikaku), or simply Maru 4. Under the terms of the program, the four light cruisers (kei jun’yōkan),also referred to as type B cruisers (otsu-gata jun’yōkan, or simply otsu jun) and officially classed as second-class cruisers (ni-tō jun’yōkan), were to fulfill the role of destroyer squadron flagships. At that time destroyer squadrons (DesRon), called literarily torpedo squadrons (suirai sentai), consisted of four four-ship destroyer divisions (DesDiv, or kuchiku-tai). The design plans of the new ships were prepared at Navy Technical Department (Kansei Honbu, or Kanpon) by a team led by Shōshō (Rear Admiral) Keiji Fukuda. The final version of the plans was approved in October 1939. The cruisers featured graceful, slender deck lines, a single funnel and a compact superstructure. Continuous main deck ran along the entire length of the hull, rising towards the bow and dropping slightly in the stern section. The ships were powered by six Kanpon Ro-Gō oil-fired boilers feeding steam to four turbine sets, which drove four propellers. Propulsion system generated a total of 100,000 shp, which translated into a top speed of 35 knots. With the bunkerage of 1,406 tons, the ships had a range of 6,000 NM at a cruising speed of 18 knots. Relatively light armor weighing 656 tons was designed to protect the key areas of the vessel (mainly machinery and magazine spaces) against 127 and 152 mm shells. Propulsion system compartments (boiler rooms, engine rooms and electric generator rooms) were protected by a 60 mm armor belt, a 20 mm middle deck and by two transverse 20 mm watertight bulkheads. The main artillery ammunition magazines, adjacent to the bulkheads, featured 55 mm armor plating on the sides, 20 mm armor on the roofs, 20 and 25 mm plating in the front section (forward magazines) and 20 mm in the back (aft magazines). The wheelhouse armor protection consisted of 40 mm plating in the front, 20 mm on the sides and floor, 30 mm on the roof and 16 mm in the back. Steering gear and rudder rooms in the aft section of the ship featured 20 and 30 mm armor on the sides, 20 mm on the roof and 16 mm in the front and back. Other vital structural elements and pieces of equipment were also protected by armored plates. However, there was no anti-torpedo protection due to the small beam of the cruisers’ hulls. The only anti-flooding measure in the event of hull breach were watertight transverse and longitudinal bulkheads. 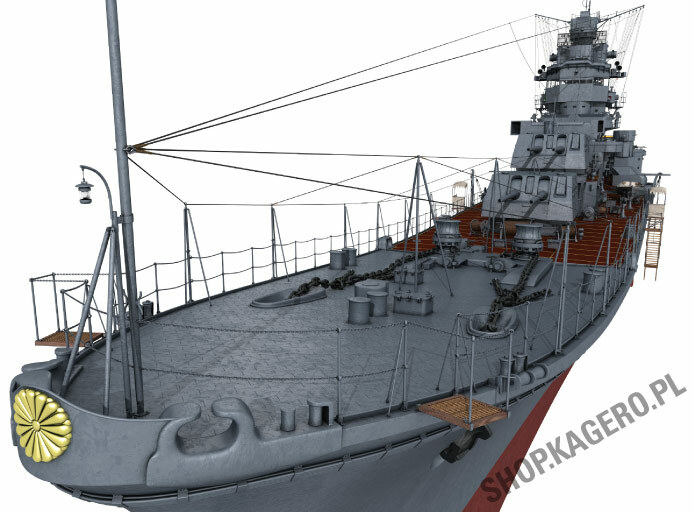 The main battery consisted of six 152.4 mm 50-cal Type 41 15-cm guns (50-kōkei 41-shiki 15-senchimētoru hō) mounted in three triple turrets – two superimposed turrets forward of the superstructure and a single aft turret, behind mainmast. A twin turret mounting heavy 76.2 mm 60-cal Type 98 8-cm high-angle guns (60-kōkei 98-shiki 8-senchimētoru kōkaku-hō) was mounted on each side of the superstructure. Agano-class light AA armament fit differed from ship to ship and underwent changes during the vessels’ service lives as a result of refits and modernizations (see below). Two Type 92 Model 4 quadruple torpedo launchers (61-senchimētoru 92-shiki 4-gata 4-rensō gyorai hassha-kan) were installed on the ship’s centerline underneath the aircraft platform and catapult. The ships carried 16 610 mm Type 93 Model 1 Modification 1/2 torpedoes (93-shiki 1-gata kai 1/2 gyorai), eight in the tubes and eight at the ready for a quick re-load. In addition, the cruisers were equipped with two rails for Type 95 Modification 1/2 depth charges (95-shiki kai 1/2 bakurai) with a total supply of 18 charges. Later on newer Type 2 Mod. 1/2 DCs (2-shiki kai 1/2 bakurai) depth charges were used. The ASW suite consisted of Type 93 Model 2 hydrophone (93-shiki 2-gata suichū chōonki) and Type 93 Model 3 sonar (93-shiki 3-gata sagushingi). The cruisers carried two three-seat Type 0 reconnaissance seaplanes built by Aichi (Rei-shiki sanza suijō teisatsuki, E13A1, or “Jake” in the Allied code). The machines were stowed on the aircraft platform located amidships and were launched using a 19-meter Kure-Type Mark 2 Model 5 catapult (Kure-shiki 2-gō shashutsu-ki 5-gata). Upon the return from a mission the aircraft would land alongside the ship before being hoisted onto the deck by a 15-meter crane attached to the mainmast. Fire control of the main battery guns was performed using Type 94 Model 5 director (94-shiki 5-gata hōiban shōjun sōchi) mounted in a round turret at the top of the superstructure. The director consisted of a 6 m Type 14 rangefinder (14-shiki sokukyogi; another such unit was mounted on the roof of the main artillery turret No 2) and Type 94 Model 4 computer (94-shiki 4-gata shagekiban). The fire of heavy HA guns was controlled by a pair of Type 94 high-angle directors (94-shiki kōsha sōchi) with 4.5 m Type 94 high-angle rangefinders (94-shiki kōkaku sokukyogi) mounted in turrets on each side of the funnel and Type 94 high-angle computer (94-shiki kōsha shagekiban). Light AA artillery featured a Type 95 machine-gun director (95-shiki kōsha shageki sōchi) with a 2 m rangefinder mounted in a round turret forward of the superstructure, as well as auxiliary LPR (Le Prieur) sights with mechanical computers. The ships also featured two 97 Model 1 torpedo directors (97-shiki 1-gata gyorai hōiban sōchi) and a Type 93 torpedo computer (93-shiki gyorai shagekiban). 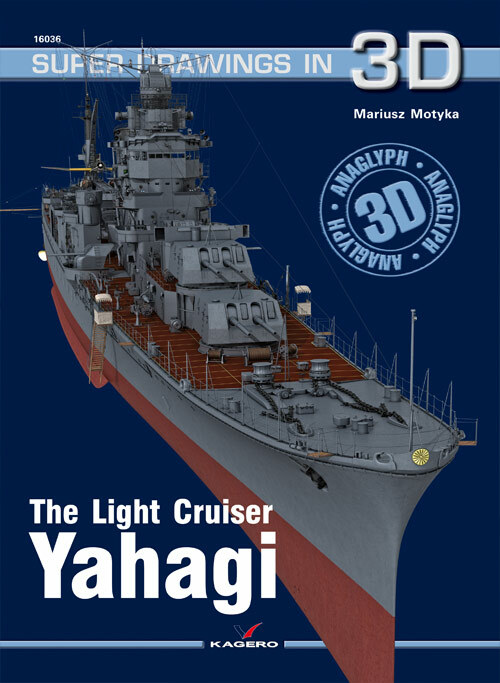 Yahagi was laid down at Sasebo Naval Arsenal (Sasebo Kaigun Kōshō) on November 11, 1941 (a few weeks before the outbreak of war in the Pacific) as Type B cruiser No 134. On August 20, 1942 the ship was officially named Yahagi, before being launched on October 25 (some sources claim the launch took place on September 25, since on that day Yahagi was assigned to Sasebo Naval Base (Sasebo Chinjufu). After fitting out and builder’s trials had been completed, Yahagi was commissioned in the Imperial Japanese Navy (IJN) (Dai Nippon Teikoku Kaigun) on December 29, 1943 with Taisa (Captain) Matake Yoshimura in command. As completed, Yahagi carried 14 Type 96 25-mm machine guns (96-shiki 25-miri kijū) – six in two triple mounts on each side of a platform forward of the superstructure and eight in four twin mounts on each side of the aircraft platform and forward of the mainmast. The number of AA guns actually exceeded the originally planned configuration, but it still soon proved inadequate as the IJN continued to suffer huge losses in the U.S. air attacks. As a result, in late January/early February 1944 all twin mounts were replaced with triple-mounted guns and two additional triple mounts were added on the quarterdeck. A total of eight single 25 mm guns were also installed (four on the bow and four on the stern of the ship). The refit brought the number of light AA guns to 32, although the ship still featured only a single Type 95 director. The cruiser was also equipped with a Mark 21 air-search radar (2-shiki 2-gō denpa tanshingi 1-gata, abbreviated 2-gō 1-gata dentan or 21-gō dentan). The radar’s “mattress” antenna was mounted on the front side of the main rangefinder on the roof of the superstructure. In March/April the ship also received radar-intercept receivers Model E27 and Model 3 (E27-gata and 3-gata raiki shingō tansakuki), which generated warnings whenever the ship was within range of enemy meter and centimeter-wave radars. After the modernization had been completed, Yahagi was assigned to Third Fleet (Dai-San Kantai) and arrived in Singapore on February 13, before transferring to anchorage at Lingga Roads a week later. On February 23 Yahagi became the flagship of DesRon 10 (Dai-Jū Suirai Sentai), commanded by Shōshō (Rear Admiral) Susumu Kimura. Until May the cruiser was busy performing work-up evolutions and anti-submarine patrols. On May 11 Yahagi led other DesRon 10 vessels out of Lingga Roads and headed to an anchorage at Tawi-Tawi Group in Sulu Archipelago, where she arrived on May 15. There DesRon 10 joined First Carrier Division (Dai-Ichi Kōkū Sentai; aircraft carriers Taihō, Zuikaku and Shōkaku) and CruDiv 5 (Dai-Go Sentai; heavy cruisers Myōkō and Haguro) to form the so called “A” Force (Kō Butai) – part of First Mobile Force (Dai-Ichi Kidō Butai), commanded by Chūjō (Vice Admiral) Jisaburō Ozawa. June 19 – 20 saw Yahagi take part in a battle in the Philippine Sea under Operation “A” (A-gō Sakusen), in which the Imperial Navy suffered a humiliating defeat. The cruiser suffered no damage since her role in the battle was in fact marginal (except picking up survivors from the torpedoed aircraft carrier Shōkaku). On June 24 Yahagi arrived at anchorage in the Inland Sea before entering Kure Navy Yard. While she was docked at Kure, Yahagi received additional AA armament and new radar gear. Two triple-mounted Type 96 25-mm machine guns were added on each side of the aircraft platform, while another ten 25 mm guns in single mounts were installed in various locations around the ship’s upper deck and aircraft platform. Total number of 25 mm AA guns was thus increased to 48. Other additions included a second air-search radar (Mark 13 - 3-shiki 1-gō denpa tanshingi 3-gata, or, in short, 1-gō 3-gata dentan) and a Mark 22 Mod. 4 surface-search radar (kashō 2-gō denpa tanshingi 2-gata kai 4, in short - 2-gō 2-gata dentan kai 4 or 22-gō dentan kai 4). Mark 13 “ladder” antenna was installed on the ship’s foremast, while the characteristic Mark 22 “horn” antennas were placed on each side of the superstructure. The Mark 22 set could also be used as the main battery fire control radar.